Sinks: they’re such a familiar sight, you may overlook just how much you use them. Thirsty? Get a glass of water from the sink. Have a pile of dirty dishes? Toss them in the sink and give them a good scrubbing. eople often use sinks for much more than just doing dishes, and because of this, they are especially prone to getting dirty, scuffed, scratched, clogged, or developing odors. So, it is crucial to learn how to clean a kitchen sink properly if you want to keep yours in good condition. You’re also going to learn how to clean a smelly drain and how to unclog a kitchen sink. Despite how much soap we use in them, kitchen sinks can get dirty too! However, the type of sink impacts how you clean it. The following tips can help you clean the unique material of your kitchen sink. Porcelain sinks are common in many older homes and can also add a vintage flair to more modern kitchens. However, porcelain is extremely susceptible to chips, cracking, and discoloration. For weekly cleaning, mix dish soap with hot water and gently scrub on the surface of the sink. For deeper cleaning or to remove stains, mix ammonia and baking soda to create a powerful cleaning solution. Scrub the stained areas with a non-abrasive sponge, rinsing and repeating as necessary. Granite sinks are beautiful and durable, but many household cleaners are too harsh to be used in granite sinks. A mild dish detergent will clean your sink and granite countertop; using a non-abrasive sponge, gently scrub the surface of the granite sink, rinsing with warm water. Use a clean soft cloth to dry the surface before applying a thin layer of olive or mineral oil. Like all our other DIY granite countertop cleaner recipes, the oil helps to restore the shine of granite while also protecting the stone. Clean your sink this way once a week to keep the granite looking like new. The care for and clean your copper sink will often depend on whether it has a patina finish. For sinks with a patina finish or those with a weathered or aged appearance, maintenance is as easy as washing it with a mild dish soap any time the sink looks dirty. The soapy water will do miracles and keeps your sink sparkling longer. Apply a high-quality wax designed for plumbing features as extra protection, especially in areas with hard water. Because copper is naturally antibacterial, no further cleaning or harsh chemicals are needed. 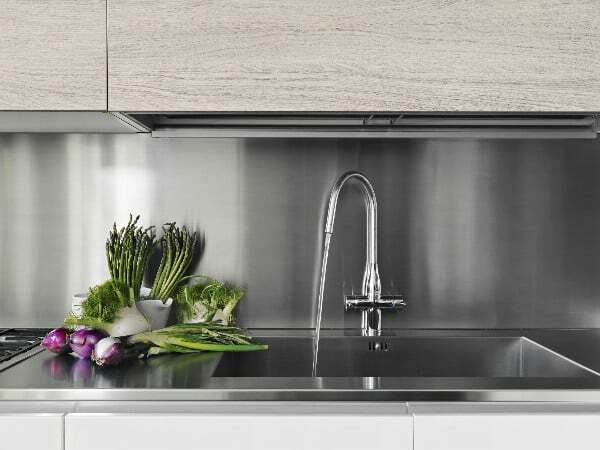 Stainless steel sinks are incredibly durable but can quickly lose their shine. To keep your stainless sparkling, start by rinsing any grime or food particles with warm water. Next, sprinkle the sink with bake soda and gently scrub it in; the bake soda is non-abrasive and will not scratch the surface of the sink. Rinse the sink with white vinegar, which will cause the baking soda to bubble and fix as it disinfects. After rinsing one final time with water, rub the surface with a lemon or orange peel to leave behind a fresh, citrus scent. If you have a garbage disposal, you should clean it as often as the rest of your sink. Cleaning and sharpening the blades on your garbage disposal can keep it running smoothly and help it work well for years to come. The following DIY tips can help you clean your garbage disposal at home without purchasing chemical cleaners. 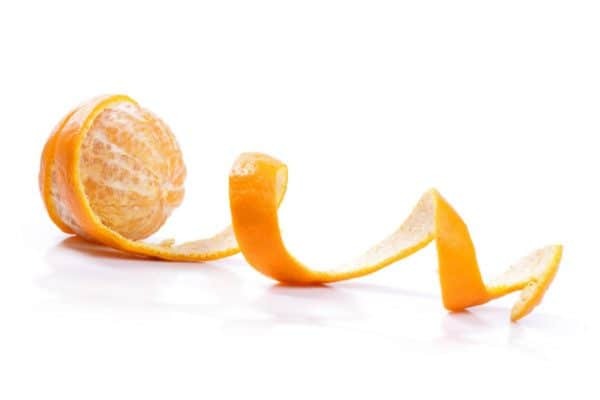 Next time you peel an orange or eat a grapefruit, don’t throw the peels in the trash. Instead, put the citrus peels down the garbage disposal and run them through with water. See more on this organic drain cleaning solution here. Not only will the citrus create a pleasant smell, but the oils from the peels can also help coat and protect the blade. 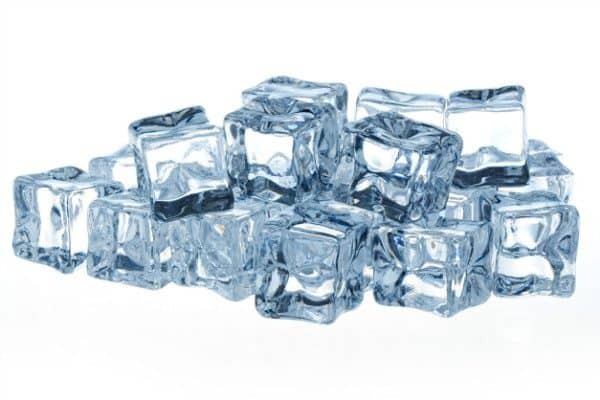 Running ice cubes through the garbage disposal is one of the most effective methods for sharpening the blades. For more effective cleaning power, consider freezing a mixture of water and vinegar or adding rock salt to the ice. While garbage disposal refreshers are available at many stores, it is also possible to make your own at home! You’ll need baking soda, salt, liquid dish soap, and the juice and zest of one lemon. Mix all ingredients until the mixture resembles coarse sand. Next, scoop and shape spoonfuls of the mixture onto a piece of parchment paper, allowing them to dry overnight. The homemade tablets can be dropped into the garbage disposal as needed to clean and refresh it! Food odors can linger in your sink long after they have gone down the garbage disposal. The most common causes of kitchen sink odors are food particles trapped beneath the garbage disposal blades or those that settle in the p-trap. This decomposing food can cause unpleasant odors if left in the plumbing. Here’s how to clean a smelly drain. One of the quickest and easiest ways to clean out your p-trap is with baking soda and warm water. Pour the soda down the drain, rinsing with the water. The bake soda can deodorize the drain while also killing any bacteria causing the odors. For sinks with a garbage disposal, putting ice cubes in the disposal should help clean the blades and loosen any trapped food particles. For day to day maintenance, leave the garbage disposal on under running water for at least 20 seconds every time you use it. A clogged kitchen sink can disrupt your ability to use your kitchen. Believe it or not, similar to how to unclog a shower drain, you can unclog a kitchen sink without using chemicals or calling the plumber. Here’s a home remedy for a clogged drain. You’ll find that one of the most effective ways to clean a clogged sink is by creating a baking soda and vinegar drain cleaner volcano. You’ll need bake soda, white vinegar, water, and a pot. Pour boiling water down the drain to loosen any hardened buildup. Next, dump the soda into the drain; follow this immediately by a mixture of vinegar and 1 cup hot water. Plug the drain to contain the bubbly reaction and let sit for 5 to 10 minutes. Finish by flushing the drain one last time with a pot of boiling water. Baking soda volcanoes are extremely efficient at unclogging sinks for numerous reasons. First, the boiling water loosens any hardened particles or sludge in the pipes. 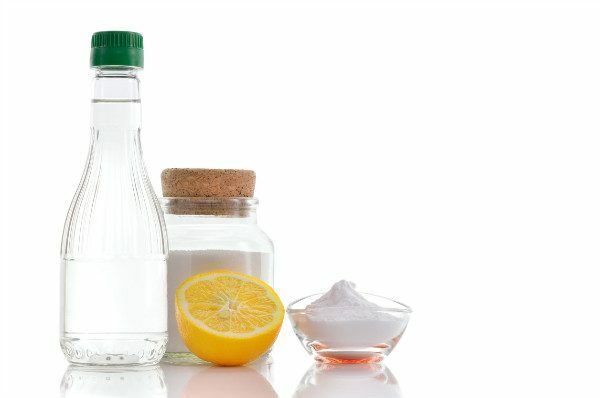 The combination of bake soda and vinegar creates a bubbly reaction that jolts the clogs loose while also helping to neutralize odors. Lastly, pouring a second pot of boiling water in the drain washes away any remaining particles. 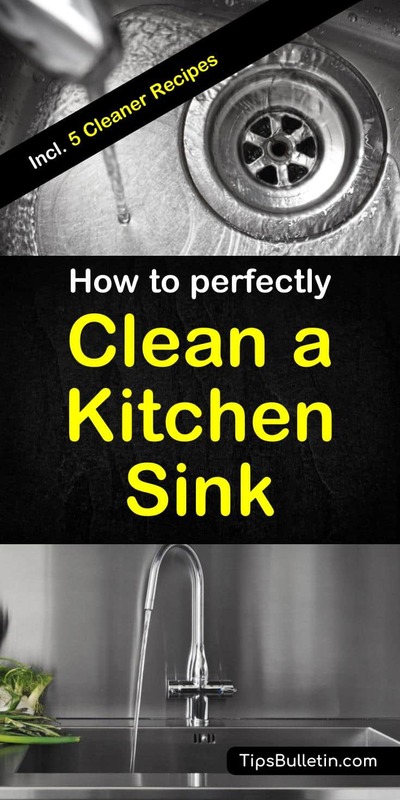 Whether it’s your first time learning how to clean a kitchen sink or you’ve been struggling through unsuccessful cleaning for years, be sure to try these methods. You’ll find they will work for you every time. You may even have some fun! 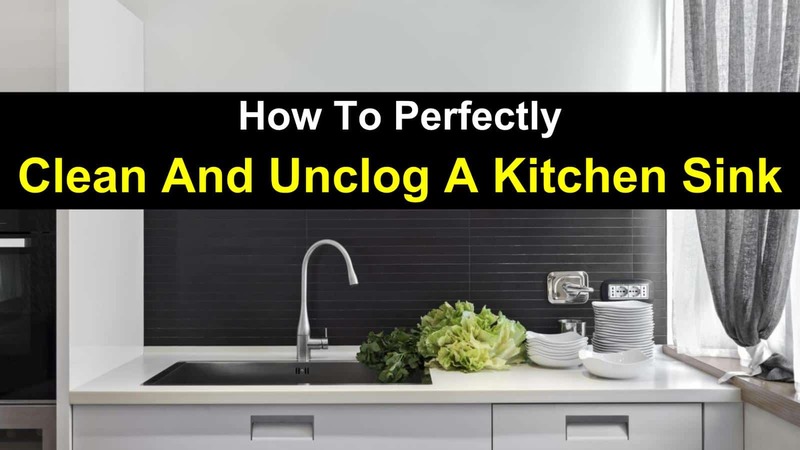 In this article, you learned how to clean a kitchen sink, how to clean a smelly drain, and how to unclog a kitchen sink. Know someone who could benefit from tips on cleaning sinks? Use the buttons below to share to Facebook, Twitter, and Pinterest!